While you can do quite a bit of research about Hotwheels on the internet, there is othing like a good price and identification guide to learn which cars are valuable, and which variations of those cars are the most sought after. 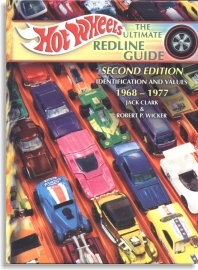 The Ultimate Redline Guide, Second Edition, Identification and Values, (Jack Clark and Robert P. Wicker). No serious redline collector can afford to be without this book. Comprehensive and well organized, Clark and Wicker have cataloged the entire redline era in one of the best collector pricing guides we've ever seen. HIGHLY RECOMMENDED! No serious redline collector can afford to be without this book. Huge color photos of every car in the Redline Era, (1968 - 1977) are presented with detailed descriptions of the minute differences in each casting to let you easily spot the difference between a $5.00 and $5000.00 car. Estimated values for loose and blister packed cars in mint condition are listed by color and series -- a well written section at the beginning of the guide tells how to value cars that have play wear and other conditions that make then less than mint. Warman's Hotwheels Field Guide, (Michael Zarnock), is a feeble attempt at writing a serious Hotwheel's collectors guide book. It appears useful at first glance, but you will find yourself frustrated if you attempt to use the guide "in the field". Many cars are not listed at all, and information about the variations that make the difference between a true gem and a $2.00 toy are not to be found. This book is suitable for kids and the less-than serious collector who just wants to look at some pictures of Hotwheels and some Redlines. 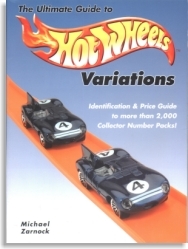 The Ultimate Guide to Hotwheels Variations, (Michael Zarnock), is "ok"... Somewhat useful, but poorly arranged. Many times you find the text description and pricing for a Hotwheels car on one page, and the photo of it on another -- You find yourself flipping back and forth trying to figure out which variation you have. 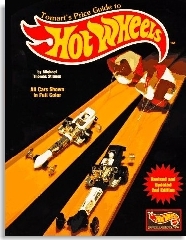 Tomart's Price Guide to Hot Wheels: 1968-1997 by Michael Thomas Strauss, 2nd edition (March 1997),ISBN: 0914293338. 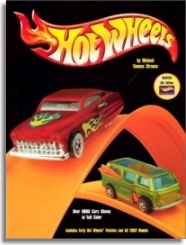 Tomart's Price Guide to Hot Wheels Collectibles by Mike Strauss, 5th Edition, (2002), ISBN# 0914293524.